Finding the right sentiment, verse, or greeting for a handmade birthday card can sometimes be a challenge. When you have spent a lot of time creating a special handmade birthday card it seems a shame to finish the card without a special greeting to match. 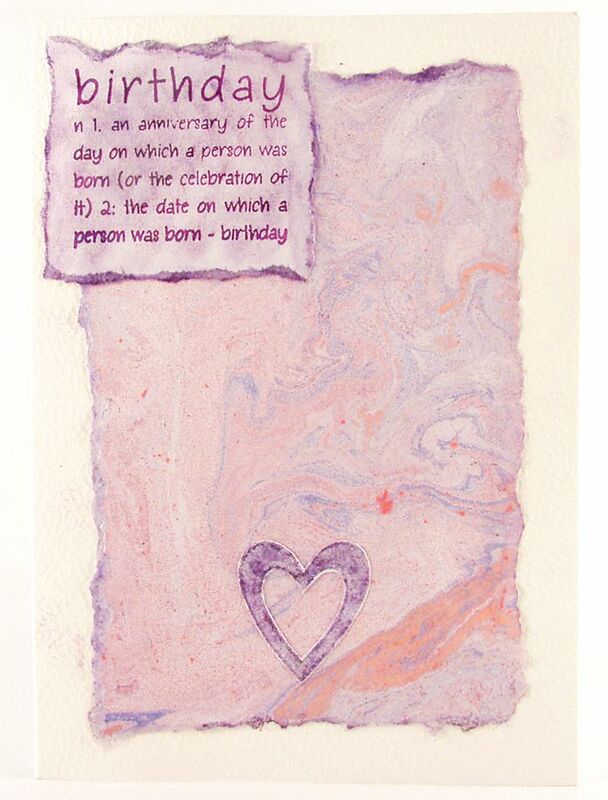 Sentiments and greetings can also provide inspiration for card designs. Print a suitable sentiment or greeting onto a card and add decorations with appropriate rubber stamps and other embellishments. Poems make interesting and effective sentiments and greetings for birthday cards. There are plenty to choose from and many of these are far removed from the pun-laden poems and verses in commercially produced birthday cards. Poem Source has a selection of original birthday-themed poems. Imag-e-Nation has verses and poems which are particularly well suited to birthday cards. Special Birthday Poems has an extensive range of birthday poems, categorized into ages, and themes. Verses 4 Cards has birthday poems broken down by section. Poems for Free has tpoems by Nicholas Gordan are free for non-commercial use. Quotations are ideal for use as sentiments and greetings for birthday cards. Quotations are often witty or thought-provoking and can be used with a wide variety of card designs. Quote Garden offers a wide range of birthday-themed quotes. Think Exist has birthday-themed quotations. A birthday toast or blessing is a short and meaningful sentiment to add to birthday cards. Think Exist has birthday blessings. Irish Celtic Jewels has Irish birthday toasts. If you are making an amusing or funny birthday card then a joke may be a good alternative to a traditional verse or greeting. Here are some clean jokes that are ideal for adding to handmade birthday cards. Coolest Kid Birthday Party has child-friendly birthday themed jokes. Scatty has clean birthday jokes. On this day themes can make an interesting variation from traditional birthday greetings and sentiments. A simple heading saying "On This Day" followed by a list of interesting events and ending with "and your birthday" will make a thoughtful card. New York Times has headlines from this date from previous years. On This Day lists of events from history, notable birthdays and other useful information. Activity Village: Kid's themed birthday puzzles that are ideal for printing and adding to a birthday card to make an unusual card. Birthday Celebrations: Spell out "Happy Birthday" in different languages. Match the sentiment, verse, or greeting to the design of your card. A traditional design is complemented by a traditional or classic verse or greeting. Alphabet rubber stamps are useful for stamping short greetings. Print text to add to handmade cards if you are worried about your writing or don't have access to alphabet stamps.